This past week was fun filled and action packed. It was a much needed break from the hustle and bustle of my everyday life. A break from the running around and rushing about that seems to occupy every moment of my days. The kids and I enjoyed a weekend at Great Wolf Lodge with two other families. It was entertaining, despite the craziness of this whole adventure. Watching Thing 1 and Thing 2 run around all day with smiles on their faces was enough to warm my heart. There were no tears, no fighting, no arguments. They had fun. For someone who is terrified of putting her head under water, I let myself be coerced to go down two of the water slides. What a blast! I never laughed so hard in my life, as the rubber raft was catapulted off the launch pad and down the tube. However, as much fun as the slides were, the best part of this water filled weekend was sitting in the hot tub outside, enjoying the view and catching up with two good friends, while their wonderful husbands sat inside and ensured the all kids were ok and no one snagged our tables. At the end of our weekend, we also had the chance to saunter down to the Falls. 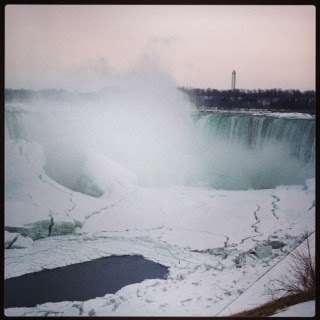 I had never seen the Falls in winter and I was blown away. What the cold weather created along the Niagara escarpment was fantastic. And even though the wind and the frigid air beat against our faces, we spent 30 minutes just marvelling at the magnificent, partially frozen view. The second half of our break was a road trip to Montreal in La Belle Province! We took the train and I am glad I did. The weather wasn't cooperative, like most of this winter. Driving would have be challenging at best. Looking out the window of our train car, I could barely see a few feet ahead. From inside the train, a blanket of white draped the train and created a cocoon like quality for the travellers inside. This train ride was fun for the kids and a welcome reprieve for me. I didn't have to drive! Yay! Instead, I sat back and read my book, CLAIRE AND SERAFIM, getting lost in the words of a wonderful author, Mark Lavorato. My reason for visiting Montreal was to visit with a dear, old friend of mine who is a new mother. She and I reconnected via social media almost a decade ago and have become bosom buddies. She is my reason and logic when mine disappears. She is also my sounding board. Our visit was nice, slow and fun. We decided to visit the Musee des Beaux Arts. The kids are wonderfully in tune to the world of art and delight in visiting galleries and museums around the world. My son, in particular, is fond of fine art. I love watching his reaction as he discovers the masters and new contemporary artists. High tea at the Birk's cafe was next on our to-do list. I love the idea of high tea - a time where friends can meet and converse over canapés and tea. This was completely lost on my son. He just couldn't grasp why people wanted to have HIGH TEA. Even after our explanation of what it meant in years gone by and also offering up that there was LOW TEA too, he just didn't want any part of it. Why did the tea have to steep? Why are there little sandwiches? Can I have a macaron? The questions went on for a while. And even though he complained, I truly believe he will remember this day and appreciate it later in life. BUT the most entertaining part of the week for my kids was the train ride home and the possibility of being kicked off the train. In my mind, my return tickets were for SUNDAY. I boarded the train, suitcase in hand, kids in tow and book ready to be completed on SATURDAY. As the train pulled away from the station, we made our way to our seats, only to find they were occupied. The customer service manager came over and indicated that this was "noooooo problem". The kids looked worried. I wasn't too worried, we were headed west and that was the direction we needed to go. Long story short, this error cost me three additional one way tickets. Apparently, the rail system doesn't do credits...so I am out another $250 BUT, as my kids put it, they have a story to tell. This is what happens when momma is overwhelmed. I could have sworn I said "Return for Saturday please" when booking. All the fun things we did and THIS is what they are sharing with their friends. "Mom made a mistake and we got on the right train on the wrong day and had to buy new tickets. We almost got kicked off". Yup. I spent hundreds of dollars this week trying to entertain them and escape when all I had to do is buy a train ticket and get on the wrong train to make this memorable. And so I am back and the craziness begins with a vengeance. I can't squeeze everything into 24 hours so I will have to re-prioritize. So what comes off the list first so I don't end up on the wrong train again? I am not going to sweat the small stuff anymore. But the truth is reality bites, and I want to be on that train going anywhere again, ticket or no ticket. Talk to me! Have you ever been so tired that you overlooked the simplest thing?